Items controls are everything that derives from System.Windows.Controls.ItemsControl. The HeaderedItemsControl control is a control that supports a collection of items with headers. The DataGridCellsPresenter control is used by the Grid control template to display the cells. The DataGridCellsPresenter control is used by the Grid control template to display the header cells. The MenuBase control is the base class for the Menu and ContextMenu controls. The ContextMenu control is the menu that shows up when you right-click the element. The Menu control allows you to nest MenuItems forming a menu that can run commands. 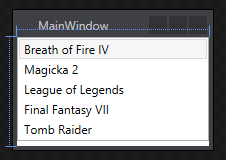 The ComboBox control allows you to select a single option from the collection. To bind an enum to a ComboBox you can use this approach posted on Stack Overflow. The ListBox control allows you to select one or more items from a collection. The DataGrid control can be used to show tabular data. By default it auto generate columns by reading the public properties of the object. The TabControl control allows you to place controls in different tabs. The StatusBar control can contain a collection of controls that will be displayed. The TreeView control allows to bind items with hierarchy.